Knox Gun Guy: Beware of wolves . . .
Tennessee prosecutors still have discretion in holding adult gun owners accountable in such cases. In May, Kelly Pittman was indicted by a Hamilton County grand jury on charges of criminally negligent homicide and child neglect in the death of her 3-year-old son, Gavin Pittman, who accidentally shot himself in the head after finding a loaded pistol in the unlocked glove box of the family minivan. How much more can you punish a parent who is either habitually negligent, or on one occassion made a bad decision? The reporter only sourced one side of the argument, failing to ask either the Tennessee Firearms Association or the NRA (take back those creds) for input. Yes, it is wise to keep unused firearms out of the reach of unauthorized persons. It is also wise to wear seat belts, keep household chemicals out of reach, and avoid leaving little ones unattended in bathtubs. Expanding background checks to cover all gun sales. Preventing those on terrorist watch lists from being able to legally purchase firearms. An “assault weapons ban” that would prevent the commercial sale of high capacity semi-automatic tactical rifles designed specifically for military purposes. Looking at those in order, background checks do little to curb crime, escpecially when the sitting president pardons those who are in prison for "gun crime". In Washington State, a person cannot hand a gun to another person, without first having a background check done. Are they advocating that in Tennessee? Concerning the Terrorist Watch List, do they really want to prevent Dr. Patrick Hackett from purchasing a gun, just because he shares a name with a bad guy? What about due process? They obviously don't understand our nation's history very well either. After all, the Second Amendment (which they ostensibly support), was all about a citizenry being armed on par with the standing army. That meant a muzzle-loading musket in the eighteenth century. In the twenty-first century, it means a modern full-auto rifle without a magazine capacity limitation. Although we basically lost that with the 1934 National Firearms Act. How do they propose to enforce an "assault weapons ban", if not by taking them away from law-abiding citizens. I get it. They can pass laws that make these legal firearms illegal, thus turning the law-abiding into instant felons. But, what army would they send to confiscate them? What sort of conflagration would they ignite? President Obama and Hillary Clinton are wrong to think that arbitrary lists are a valid and legal means of stripping Americans of their gun rights. It would be nice if the Republican Party had chosen as its standard-bearer someone who could articulate the conservative case for the Second Amendment and due process. Instead, it chose Trump. Now gun rights will be in jeopardy, no matter which of the two charlatans currently seeking the presidency prevails. Rich Seibert, this is not a forum for you to cut and paste into; or for rants. Comments are welcome, but be brief and to the point with your own words please. Stop "negotiating" excuses to INFRINGE on OUR RIGHTS. Are there any ‘legislators’ that are interested in a Constitutional Background Check? 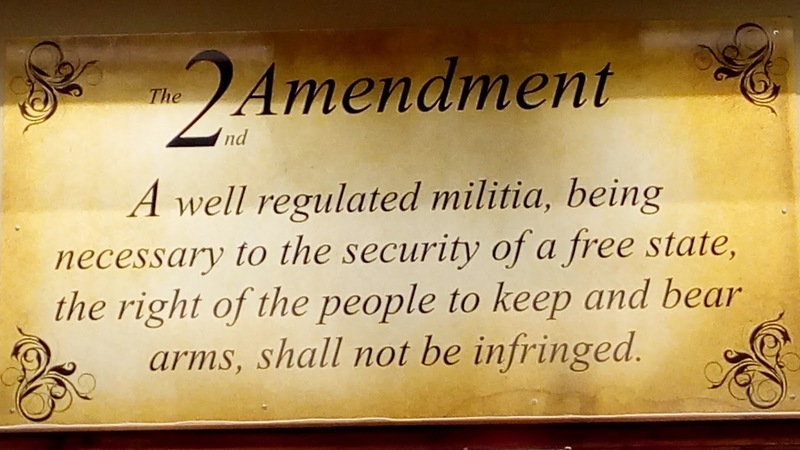 Since SHALL NOT BE INFRINGED means exactly that..
A FULL, IN DEPTH background check for ALL Politicians, Bureaucrats, and ALL government employees, and set MINIMAL INTELLIGENCE, JOB SKILLS AND CHARACTER QUALITIES that must be met before they can run for office, be appointed or hired. That way, WE, THE PEOPLE, get a much better class of politicians and bureaucrats, as well as EMPLOYEES that can be trained to do the jobs they are being hired for. Any bets on how hard the political class will fight to prevent it? THAT would be a Background Check that nearly ALL AMERICAN CITIZENS will support and I don't much care if the illegals and their sycophants don't like the idea. One million plus new felons, all armed with scary, high capacity, media labeled assault weapons! The deadline for New York residents to register their so called “Assault Weapons” and “High” (read standard) Capacity Magazines came and went. An estimated million plus, formerly law abiding, gun owners have refused to comply with Cuomo and down state Democrat’s naive belief that the NY Safe Act, passed in a so called emergency session of the New York legislature, could force free people to register their hard earned property. Re: "Preventing those on terrorist watch lists from being able to legally purchase firearms"
If the government really wants to implement this, they should be required to follow due process - or more specifically go before a judge to seek approval to add someone’s name and allow the accused person the option to be present to defend him or herself with the right to appeal. Right now, the criteria for being on the no-fly or terrorist watch list is somewhat secret and arbitrary and the latest legislation that was proposed would allow the Attorney General to add anyone based on some undefined, subjective things called “a reasonable belief” or “appropriately suspected” the person is connected with international or domestic terrorism - and the term “domestic terrorism” is so nebulously defined in 18 USC 2331(5) that it could include anyone the government doesn’t like. Re: "The Second Amendment (which they ostensibly support), was all about a citizenry being armed on par with the standing army"
The purpose of the Second Amendment is clearly stated in the preamble to the Bill of Rights - specifically “The convention of a number of states having at the time of their adopting of the Constitution, expressed a desire, in order to prevent misconstruction or abuse, of its powers that further declaratory and restrictive clauses should be added”. Note that when the Second Amendment was written, every weapon was a weapon of war, there were no restrictions on the private ownership of weapons and the militia was equally matched with the regulars. After all, if they weren’t equally matched, it would be pretty hard to deter or prevent a “misconstruction or abuse, of the government’s powers” - so in reality, the citizen militia of today should have the same firearms as the current US military. Unfortunately we are no longer equally matched because we have let our gun rights be eroded by buying into this notion if we just compromise to accommodate the people who - for whatever reason - don’t like guns they will quit trying to take away our gun rights. History has shown that no matter how much we compromise, it’s never enough so we need to stop compromising. Re: " We do not advocate confiscating guns"
The progressive philosophy is more subtle, insidious, and incremental than immediate confiscation. You can see examples of the philosophy in laws that have been implemented by like minded individuals at the state level where they don’t confiscate firearms or magazines, they just pass laws that say you can’t keep, sell, transfer, share, get them repaired, purchase ammunition, inherit, or shoot them. The Colorado magazine ban is a good example where the “owner” can keep them but not share or transfer them to anyone he is living with like his/her children or a spouse. Another example is the CA SKS Sporter ban in 2000. CT required owners of certain types of “assault weapons” to register them then later passed a law banning them which required the now known owners to sell the now banned firearms to an FFL, turn them into the police or take them out of state. Some local governments have similar laws that prohibit the ownership of certain firearms within their geographic limits and several other states (NY,NJ,CA,MA,MD) have in effect “confiscated” some types of firearms from new users by grandfathering those that are currently owned and registered but prohibiting any new ones from being purchased or retained by people moving in from out of the state. So in a disingenuous sense they are correct - the police didn’t show up at your door to take your guns or magazines away - at least not yet - they just make it onerous, legally hazardous, and nearly impossible to own them which is the way the anti-gun folks implement their incremental strategy that will allow them to smugly claim “We do not advocate confiscating guns”.